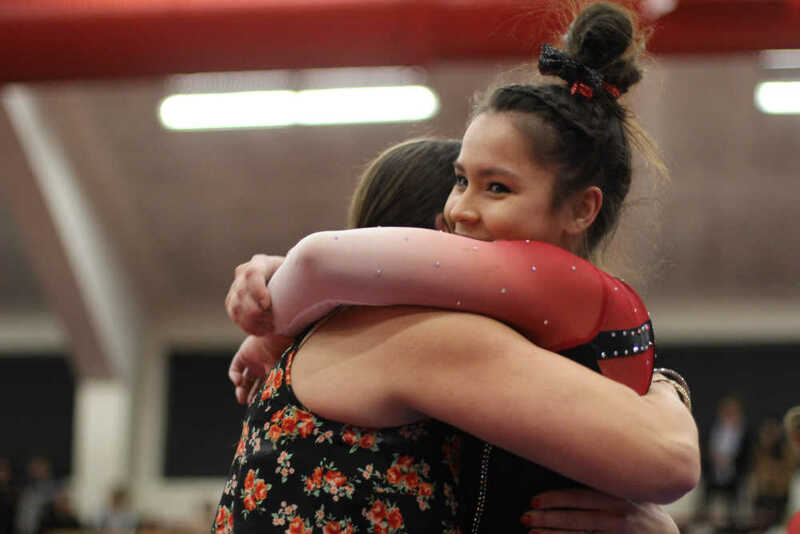 Freshman Anna Kaziska embraces Southeast coach Ashley Lawson after performing her beam routine on March 1 at Houck Field House. The Southeast Redhawks lose 188.8751-191.900 against University of Pennsylvania at their third home meet of the season on March 1. The Redhawks secured the top three all-around scores of the night. Sophomore Michael Sanders took home third with a total of 37.150. Top two were held by sophomore Alana Fischer with 37.700 and freshman Anna Kaziska with 38.500. “I was ready to redeem myself from last week because I did have a tough competition so I was really eager and ready to motivate myself and improve my scores,” Fischer said. 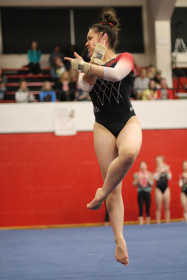 Freshman Anna Kaziska shows some flair and elevates during her floor routine Friday, March 1, at Houck Field House. Southeast strongest event of the night was the floor event with an overall score of 48.250. Kaziska captured the highest score on floor for the night with a 9.850. Junior Mackenzie Slee claimed the second highest score of the night on the floor with a score of 9.775 for her routine. Fischer gave the Redhawks a solid 9.675. Senior Allyson Bell claimed a score of 9.525, Sanders with a 9.425 and freshman Maya Tran with a score of 8.950. The Redhawks weakest event of the night was bars with an overall score of 45.625. Kaziska tied for second with University of Pennsylvania’s Libby Garfoot with a 9.700. Claiming first on bars was the Quaker’s, Jordyn Mannino. “There were a lot of mishaps, but instead of letting those sink and struggle they picked up the pieces, building on each personal success.” Southeast Coach Ashley Lawson said. Sophomore Gabrielle Adams was the Redhawks lead scorer on the vault with a 9.700 and coming in second on the apparatus behind the University of Pennsylvania’s Sydney Kraez. Kaziska also came in second on the beam behind the Quaker’s Natalie Yang. While the Redhawks have so far failed to capture a win they continue to improve every meet. “Everybody brings something unique to the team. We all come from different backgrounds and have different personalities and beliefs but to watch them come together and have that one common goal I think is something amazing to see. Even the character of the team that has been built over the last 13 weeks has been really, really amazing to watch and inspiring to see them do that.” Lawson said. Coming up on March 10 the Southeast will host the State of Missouri match at the Show-Me center against Lindenwood University and the University of Missouri at 1 P.M. Later that week they will travel down to Arkansas for the Arkansas Quad against the University of Arkansas, Lindenwood University, and Texas Woman’s University on March 16.